MILEAGE IS REDUCED TO £1 IF A JOB CROSSES THE M25 AND THE AREA WITHIN THE NORTH CIRCULAR ROAD AND RIVER THAMES. (1 in diagram). If a long move falls short of the M25 extend the mileage to the inner zone and it will work out cheaper. (2 in the diagram).... i.e St Albans to Birmingham is £1.50 per mile return but by extending the costed journey from Brent Cross that becomes £1.00 per return mile - a massive saving. A long cross-country journey outside the M25 could be reduced in price by making it one side of a triangle with a point inside the inner zone (3 in diagram!) at £30 plus £1 per return mile round all three sides instead of £20 plus £1.50 per return mile. 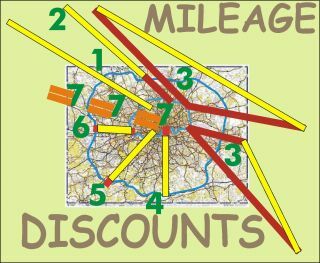 If a job in falls short of the Thames or North Circular (4 in diagram), the M25 (5), or both (6) extending the mileage accordingly may qualify for the discount. THE MILEAGE COST ON ALL REPEAT JOURNEYS OF JOBS OF TWO OR MORE TRIPS IS NOW HALVED HOWEVER MANY TRIPS. DON'T WORRY, THIS IS INCORPORATED INTO THE COSTING FORMATS ON PAGE FOUR! A smart customer moving from Norwood to Watford noticed that booking his job to Kings Langley over the M25 reduced his mileage rate so now all mileages are checked to see if extending them can reduce the cost as a matter of policy.